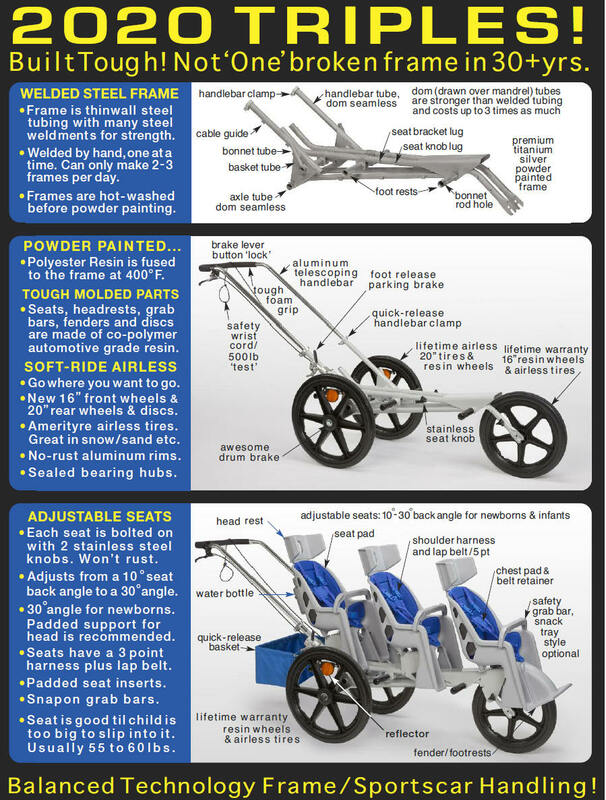 Other models include the 3, 4, 5, and new 4-8 adjustable Passenger commercial Strollers (accommodates special needs seating) and the industry standard 4 or 6 Passenger Bye-Bye Buggy. 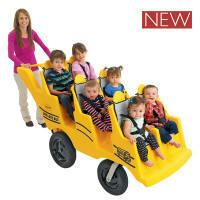 Also available are accessories for the Bye-Bye Buggy and Runabout Commercial Strollers. Discounts available for Multiple Orders. 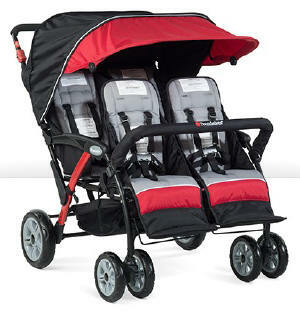 Click here for Stroller Safety Information. 6.5" from the front edge of the second row seat to the back of the first row seat. NEW!!! The new LX4 STROLLER - the largest 4 passenger foldable stroller available - rated for up to 50 lbs for each child can accommodate the smallest to the tallest. Extra large seating area and headroom fits children up to 50 lbs while still fitting through doorways. 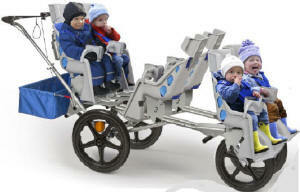 The largest wheels in the foldable 4 seater stroller provide the ultimate in manoeuvrability. 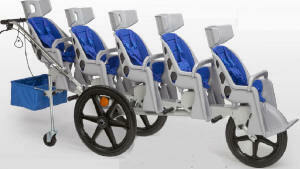 ComfortPush handle automatically disengages brake with forward motion of stroller eliminating hand fatigue for pusher. ONLY AVAILABLE IN CANADA. Adjustable 5 point harness sized to fit up to 50 lb children. 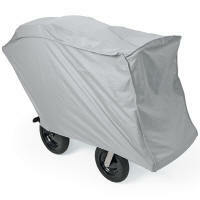 Extra large canopy shields children from harmful UV rays. NEW!!! The new LX6 STROLLER - the largest 6 passenger foldable stroller available - rated for up to 50 lbs for each child can accommodate the smallest to the tallest. Extra large seating area and headroom fits children up to 50 lbs while still fitting through doorways. 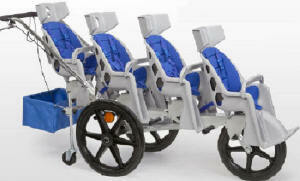 The large wheels in the foldable 6 seater stroller provide the ultimate in manoeuvrability. 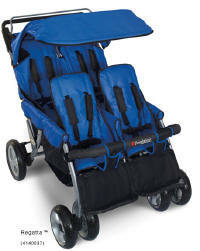 ComfortPush handle automatically disengages brake with forward motion of stroller eliminating hand fatigue for pusher. ONLY AVAILABLE IN CANADA. FB6600- SAFE STOP 4 SEAT BYE-BYE STROLLER - This Foldable Quad Stroller has all the features that make it the perfect multi-passenger stroller for use in daycare centers and homes. Hand and foot breaks and all terrain tires. Easy to fold for storage. 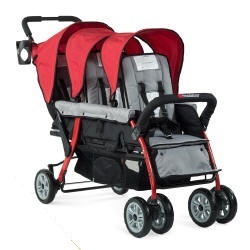 FB6700- SAFE STOP 6 SEAT BYE-BYE STROLLER - This Foldable Six Passenger Stroller has all the features that make it the perfect multi-passenger stroller for use in daycare centers and homes. Hand and foot breaks and all terrain tires. Easy to fold for storage. 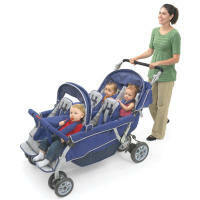 This fully assembled Buggy Stroller is a multi-person transport designed for ages 5 to 36 months. 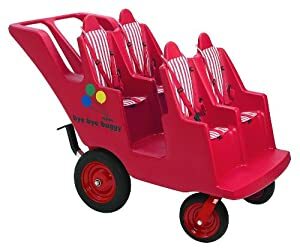 Available in 4 and 6 passenger versions, the stroller conveniently fits through doorways, and offers terraced seating so that all children can see. 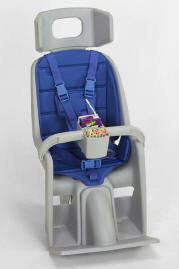 Infant seat for newborn to 5 months fits into buggy seat and secures infant in place (purchased separately) - See Below. 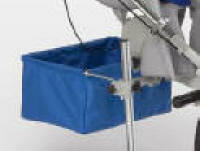 Canopy also available separately - see below. Available directly to Canadian and US Customers. 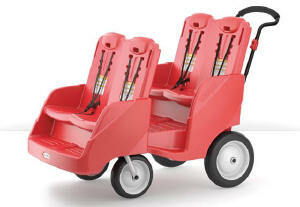 These Buggy Strollers are "Fat Tire" versions with choice of gray or red striped seats. AFB6520 INFANT SOFT BUGGY SEAT - Infant Seat - Designed to fit Bye-Bye Buggy Seat and comes with Steel Clip to hold infants securely. Easy to clean and quilted for comfort. For 0-5 months. 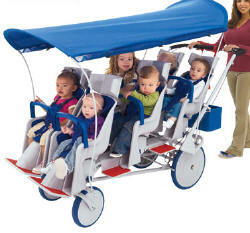 This fully assembled Buggy Stroller is a multi-person transport designed for ages 5 to 36 months. Available in a 6 passenger version. conveniently fits through doorways, and offers terraced seating so that all children can see. Infant seat for newborn to 5 months fits into buggy seat and secures infant in place (purchased separately but in red (Bye-Bye Buggy Accessories). 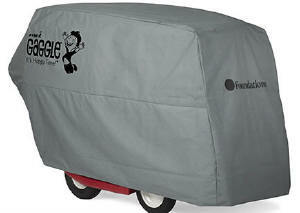 Canopy and matching Cover in Grey also available separately - see below. Available directly to Canadian and US Customers. Available in "Fat Tire" version only. Generous seat sizing comfortably accommodates children from six months old to fifty pounds. All seating positions are self loading by using EasyLoad� steps Comfortable foam wrapped push bar is ergonomically sized to eliminate hand fatigue. Polyurethane tires provide quiet smooth ride while eliminating need to inflate with air. Fits through standard commercial doorways to enable buggy to be loaded in classroom. SoftStop� brake securely stops rear wheels with one lever and puts Gaggle in park with the other Exclusive QuickFit� harness enables caregiver to adjust harness with ease to ensure proper fit. Durable double-walled body construction is impact resistant, provides superior strength, and will not corrode. The new Angeles Runabout 6 Passenger Stroller offers a solid powder-coated steel welded frame for strength and durability. 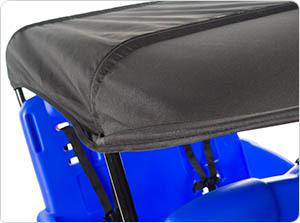 The telescoping padded handlebar adjusts from 36"H to 43"H to accommodate user's height. Solid polyurethane airless tires on spokeless wheels - they'll never go flat. Vista-View stadium seating - each child has a view. 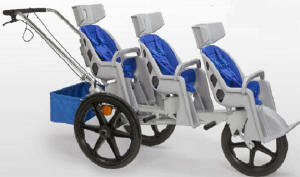 Four or Six adjustable seats recline 35 degrees and accommodate up to 40 lbs. each. Headrests are designed for privacy from the wandering hands of other passengers. Soft padded seats are made of polystyrene foam and covered with soft cotton fabric - they're surface cleanable. Available directly to Canadian and US Customers. NEW RESIN WHEELS WITH AIRLESS TIRES - LIFETIME WARRANTY ON FRAME, WHEELS AND TIRES. 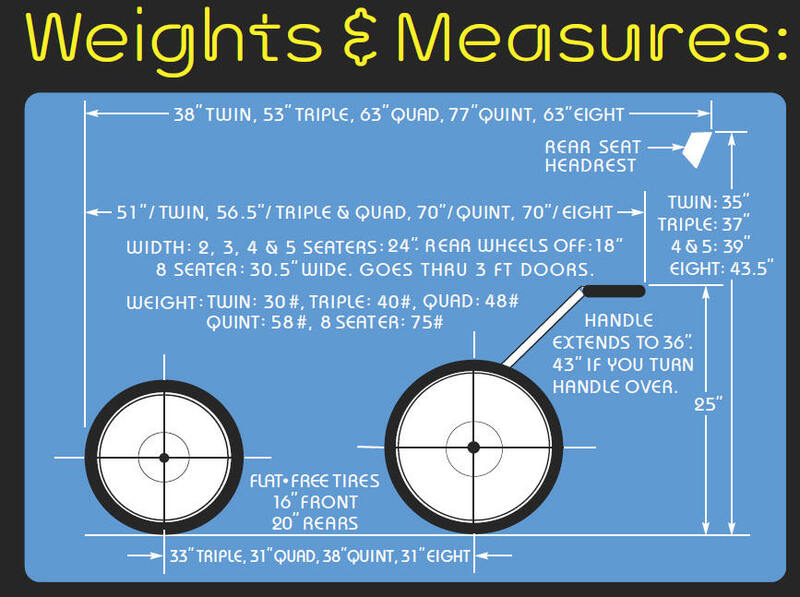 No Rust RESIN Wheels, aluminum handlebar, drum brake, parking brake, brake levers, seat brackets and bottle cage with lifetime warranty. Fully loaded 8 seater pushes with 1 finger. Optional snack grab bar holds juice box or sippy cup with well for treats. Wheelchair style parking brakes that are easy to look on right rear wheel for easy loading and unloading. Unlocks with foot. Quick Release Alloy Handlebar Clamps that can lock and unlock both sides in second. 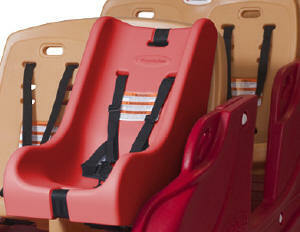 High Stadium Seating - each row has a clear view forward and easy to load. Seats accommodate children up to 60 lbs. Click here for more information on 2020 Runabout Construction. 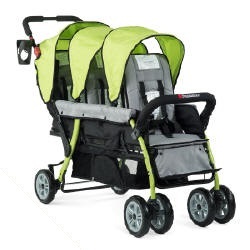 The Runabout Multi-passenger Commercial Strollers are easy to push and built to last. THE ONLY INFANT TO TODDLER MULTIPLE PASSENGER THAT DOES NOT REQUIRE ADDITIONAL ACCESSORIES. Comes with a lifetime Year Warranty on Frame, Wheels and tires. The unique design allows for these strollers to be manoeuvred through doors and around obstacles - only 24" wide (EXCEPT NEW 4-8 SEATER VERSION - 31"). See below for Accessories available for these strollers. Available directly to Canadian and US Customers. Choose from US or Canadian Decalling or Plain White - Addtional charge for decals. A complete selection of replacement parts are also available. Each Seat can accommodate child up to 60 lbs. Adapter available for Graco Car seats. SPECIAL NEEDS SEAT ALSO AVAILABLE that can accommodate 100 lbs (4-8 Seater only). Pricing includes basket. (Plain Version Shown - available in US and Canadian Versions also) - Special Feature: Center seat can face rearward for newborn or infant. Pricing includes basket. (Canadian Version Shown - available in US and Plain Versions also) - Special Feature: 30.5" Wide - Side by Side seating. 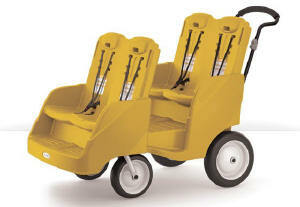 Just as easy to move as a 6 seater and well balanced. Same great Resin Wheels as all Runabouts. 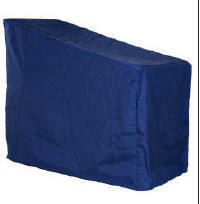 Canopy, car carrier, weather shield and nylon cover available. Pushes with one finger fully loaded. 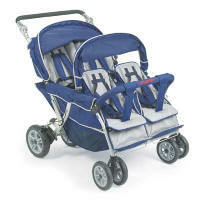 Additional Accessories include Adaptor for Graco Car Seat, Special Needs Seating and Replacement parts - call for Pricing. 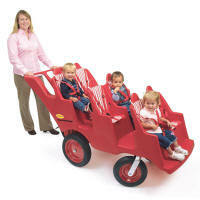 Some of these Products are UPS Shippable - Bye Bye Baby Buggy and Bye Bye Buggy must be shipped by freight. - Contact us for delivery quotes.